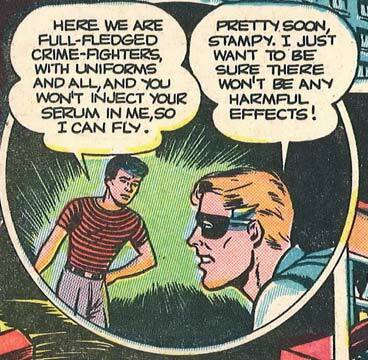 Geez, I’m starting to think Fredric Wertham was right. harmful side effects may be: Diarrhea; dizziness; flushing; headache; heartburn; stuffy nose; upset stomach; not being able to walk right for a week; and crying uncontrollably while fully clothed in the shower. Dan (2), I thought EXACTLY the same thing! Of all the Wrong Things in Comics I’ve seen on this blog over the years, this may be the wrongest. I was going to try and make up a villain worthy of this air duo and came up with a stupid character with fart powers but i think it may be too much for them to handle lol.